The emergency care center on the ground receives and assists all incoming emergencies. Virtual Emergency Room (VER) is the technology basis provided by GHC. The VER is the AescuLink system for the doctor. 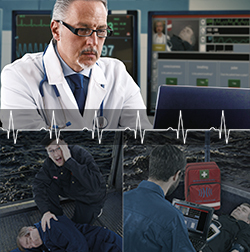 The doctor can use to quickly judge the emergency situation at a distance via audio and video connection. He provides a diagnosis based on the patient’s vital parameters and guides the required interventions. In addition, VER contains all the functionality of a medical documentation system, incl. assurance of quality, archiving, billing, etc.